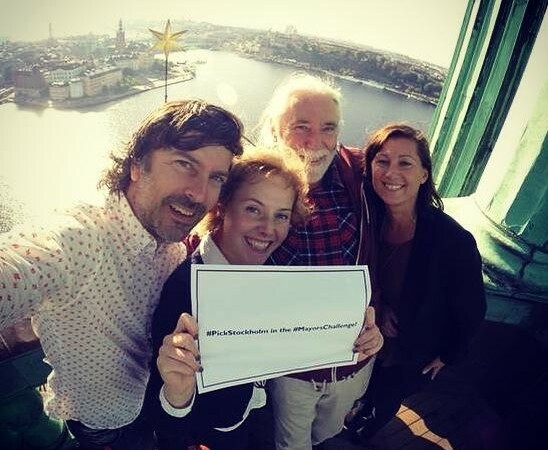 Stockholm, one of the five winning cities in the 2014 Mayors Challenge competition, will create a citywide program that activates citizens as front-line change agents to combat climate change. Together, the city and its residents will produce biochar, an organic substance that increases tree growth, sequesters carbon, and purifies storm water runoff. Stockholm Environmental Specialist Björn Embrén explains the crucial ingredient at the core of the idea and how the city will use the Mayors Challenge Prize to accomplish this ambitious goal. What is biochar? Why is it so promising and exciting? Biochar is charcoal derived from organic waste that conditions soil, increasing plant and tree growth. Increased growth of healthy foliage in turn helps to create a greener and healthier city. In addition, when mixed with soil, biochar sequesters carbon and enables increased infiltration of storm water run-off, which also helps to combat climate change. Biochar was used by indigenous people in many parts of the world as an organic soil additive until modern agriculture practices. It can be produced from many different types of organic waste such as forestry waste, straw and corn husk. We are glad to reintroduce the benefits of biochar to society today. All cities can use renewable energy sources, and the Stockholm concept can be applied all over the world. How will you use your Mayors Challenge prize to advance biochar? The Mayors Challenge prize will help Stockholm create a sustainable, carbon-negative production plant where organic waste materials will be converted into two desirable products: biochar and renewable energy in the form of district heating. District heating is a distribution system for heat from a centralized heat production plant. Citizens who bring garden waste to the plant will get biochar in return to be used in their gardens, thus increasing green growth as well as community knowledge and action to combat climate change. There is ongoing research that suggests there will be additional uses of the renewable energy produced through the conversion process. Using pyrolysis (heating in an environment with low levels of oxygen) biochar production can easily yield heat, and in the near future it is believed that companies will be able to harness this heat to produce electricity or vehicle fuel. Has your prize influenced Stockholmers to think differently about biochar? What have been some reactions or inquiries since winning the prize in September? One of the main priorities for the city is to ensure that Stockholm remains a sustainable city, as it is growing like never before. Eight in ten Stockholmers surveyed say they want to be more active combating climate change. The Mayors Challenge prize and the biochar project provide a concrete way to do this. The reactions have been positive and full of enthusiasm. And as a result of the prize, Stockholm was invited to speak at the City Innovation Summit in Barcelona. We are looking forward to seeing biochar at work! What is next for Stockholm in this initiative? What can citizens anticipate happening next? We are in the beginning stages of deciding details such as the plant location, choosing a partner for the biochar plant technology, and informing citizens about biochar and how to participate. We look forward to seeing the first biochar exiting the plant and becoming an everyday essential in citizens’ gardens! What are some resources and programs you would recommend to environmentalists and enthusiasts who want to support or learn more about biochar? Global interest for biochar is growing! There are many new organizations and websites which offer good information. The International Biochar Initiative, European Biochar Certificate, Swedish Biochar Association and the Biochar Journal are a few, though the most important recommendation is to try using biochar yourself to see the difference in your garden or flower pot. While Stockholm will be the first to implement a citywide biochar program, there are plenty of “make your own biochar” videos on the internet. Try it!